Before we jump into our main topic of interest – cyber security vs. network security – let’s try to understand what information security is first. By now it’s not totally wrong to say that Internet has revolutionized everything by changing how we do things. Social media has become the internet sensation within a few years and e-commerce giants like Amazon have made purchasing online a breeze, and Google has made everything easily accessible at our fingertips. Businesses are more digitally advanced than ever, and as technology advances, businesses’ security infrastructure must be tightened as well. Internet has evolved and so does vulnerabilities with more people taking advantage of these interconnected systems and exploit weaknesses. This pertains to information security. Information security refers to the processes and techniques designed to protect any kind of sensitive data and information whether in print or electronic form from unauthorized access. Information is a valuable asset to every individual and businesses, which makes even more important to protect them from theft or damage. 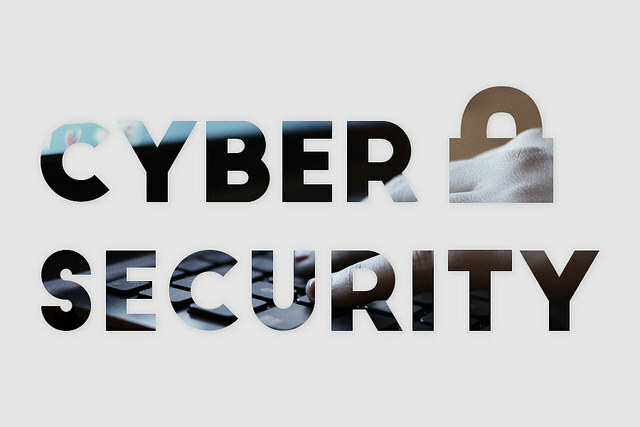 Cyber security is a subset of information security which deals with protecting internet-connected systems including hardware, software, programs, and data from potential cyberattacks. It protects the integrity of networks from unauthorized electronic access. Network security is the subset of cyber security designed to protect the integrity of any network and data that is being sent through devices in that network. Cyber security is a common term concerned with all aspects of cyber space. It is a subset of information security that deals with protecting the integrity of networks, devices, and programs from attack, damage, or unauthorized outside access. It refers to a set of techniques, technologies, and processes designed to protect systems and networks from potential cyber attacks. It protects the integrity of networks from unauthorized electronic access by implementing various security measures and controls in place. The cyber security professionals monitor all incoming and outgoing traffic to reduce the risk of cyber attacks all the while protecting the organization from unauthorized exploitation of systems. Network security is a subset of information/cyber security which deals with planning and implementing network security measures to protect the integrity of networks and programs against hacking and unauthorized access. It protects the organization’s IT infrastructure and network-accessible resources from all kinds of cyber threats such as viruses, Trojans, malware, spamware, spyware, etc. ID and passwords, internet access, firewalls, backup, encryption, comes under network security. The job of a network security professional is to make your network more secure by providing technical expertise including help with intrusion detection systems, encryption, firewalls, and digital certificates. Cyber security is a subset of information security which refers to a set of techniques and methodologies used to protect integrity of networks, devices, programs, and data from damage, attack, or unauthorized access. In simple terms, cyber security is the practice of protecting internet-connected systems and networks from digital attacks. Network security, on the other hand, is the act of protecting files and directories in a network of computers against misuse, hacking, and unauthorized access to the system. Network security is a subset of cyber security which protects the integrity of your network and network-accessible resources from unauthorized access. While both the terms are synonymous with each other, they are very different in terms of security. 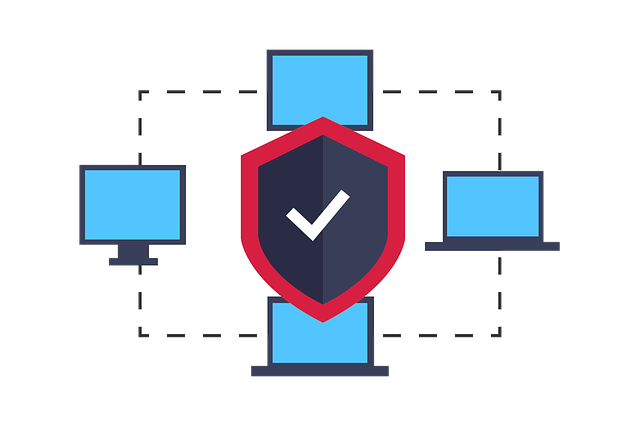 If you think of an organization as a fortified castle, network security is concerned about maintaining peace within the walls of the castle and protecting the sovereignty of the organization from network related threats. Cyber security, on the other hand, protects the organization from outside threats such as from the cyber realm. It protects the systems, networks, and programs of an organization from all kinds of digital attacks like phishing, baiting, baiting, etc. Network security is all about protecting the organization’s IT infrastructure from all kinds of online threats such as viruses. Cyber security is a broad term like information security, whereas network security is one aspect of cyber security. While in both the cases, the most critical component is the integrity of data and programs, cyber security takes monitoring and detection of threats to a greater degree. The primary concern of network security is to safeguard organizations’ IT infrastructure from within, whereas cyber security deals with safeguarding organizations’ information and security technologies (ICT) from potential cyber threats that exploit vulnerabilities in the system. Firewalls, ID and passwords, backup, encryption, come under network security. Cyber security professionals or analysts are the individuals who take full responsibility of protecting network infrastructure and interconnected systems through their expertise and knowledge of databases, firewalls, internet security, and encryption. A cyber security professional serves as an expert on cyber security protection, detection, and recovery. The main job of a security professional is to monitor all incoming and outgoing traffic, and work in collaboration with different departments in the organization to coordinate risk management tools and technologies. The job of a network security professional revolves around protecting IT infrastructure of the organization which includes securing information assets, financial information, and other confidential information. In a nutshell, cyber security is a subset of information security which deals with security of data at storage and transit, whereas network security is a subset of cyber security which is concerned with protecting the IT infrastructure of an organization and restricts access to it. Both the terms are often used in conjunction with each other, except cyber security is a term used in a much broader sense while network security is one aspect of information/cyber security. Sagar Khillar. 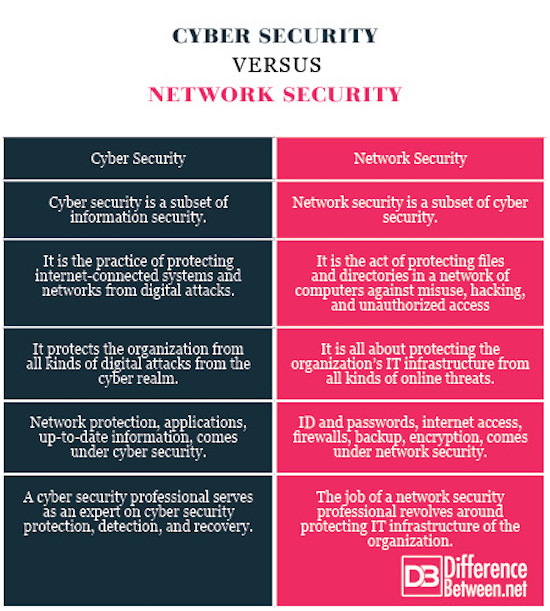 "Difference between Cyber Security and Network Security." DifferenceBetween.net. July 17, 2018 < http://www.differencebetween.net/technology/difference-between-cyber-security-and-network-security/ >.